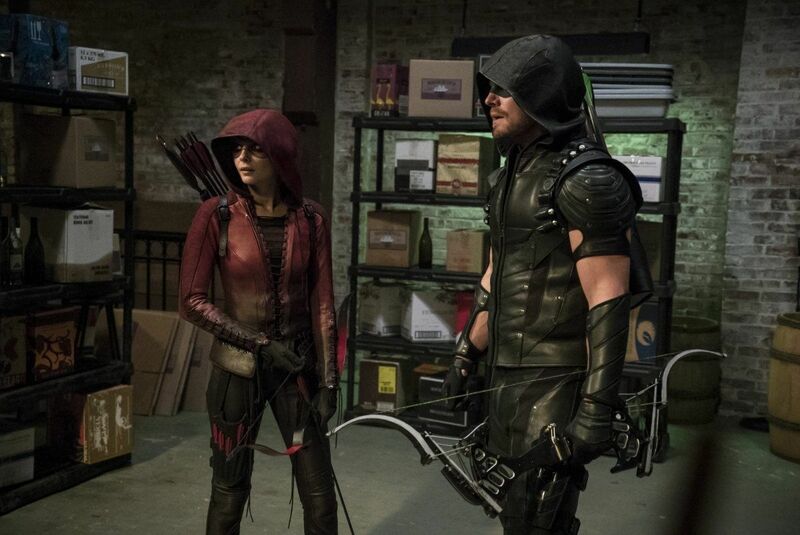 When an old friend of their mother decides to run for mayor of Star City, Ollie and Thea decide to go beyond offering their endorsement and make it their business to protect her personally as The Green Arrow and Speedy. But Thea has been changed by The Lazarus Pit and that change is becoming more pronounced the more Thea throws herself into battle. Can she hold it together in the face of a kidnapping plot orchestrated by a would-be minion of Damian Darhk? In the flashbacks, Ollie is back on Lian Yu, charged with infiltrating a new gang that has taken over the island and turned it into a poppy farm. Green Arrow: Year One (Ollie infiltrating an island being used by a drug cartel to farm poppies for heroin), the Green Arrow comics of Elliot S! Maggin and Dennis O'Neil (the theme of public figures needing to be examples as well as superheroes and the idea of Ollie running for mayor) and the Mister Terrific comics of Eric Wallace. Despite Ollie's apparently sticking to his guns about not killing, there are several moments in the fight scenes where it looks like he fatally shoots people in the chest and Laurel seems to throw one man off a building to his death. While chasing after Machin, Ollie is hit by a car, cracks the windshield and is thrown off of the car again with no apparent ill effects. Not even so much as a bruise. Why would Machin go through the trouble of resewing his fingerprints onto his hands in a mixed up fashion after cutting them off when burning them off would have been a far easier way of accomplishing the same ends? The episode opens with another new variant of the "My name is Oliver Queen..." opening. Team Arrow fight The Ghosts to save the city's water supply in the opening fight scene. This is perhaps one of the most time-honored cliches in superhero comics - stopping villains from contaminating a water supply. Jessica Danforth is an original character made for the show Arrow. Her name may, however, be a reference to Daniel Danforth Dickerson III, who was briefly mayor of Gotham City following the Batman: No Man's Land storyline. In this story, Gotham City was abandoned by the United States following a series of disasters including the release of a plague and an earthquake that leveled most of the city - not unlike what has happened with Star City on Arrow. Dickerson was the first mayor to try and rebuild after Gotham City was reclaimed by the USA. Anarky was originally an anti-hero created by writer Alan Grant and artist Norm Breyfogle in Detective Comics #608 (November 1989) as an antagonist for Batman. An idealistic child prodigy named Lonnie Machin, Anarky discovered philosophy at a young age and became concerned about the state of the world and the increasing influence of corporations and the idle rich. Creating a costume that increased his height, Lonnie embarked on a campaign of terror, beating up CEOs, encouraging homeless people to riot and hacking the accounts of evil companies and transferring their funds to various third-world relief charities. Reaction to Anarky has been mixed, to put it mildly. Alan Grant has been accused of plagiarizing the base concept of an anarchist superhero from Alan Moore's V for Vendetta and Anarky's costume appears to be modeled on that of V - the anti-hero protagonist of that book. The Anarky stories written by Grant have been said to be thinly-veiled, one-sided political screeds that use Anarky as a mouthpiece for Grant's own philosophy. Anarky himself is a Gary Stu, being a super-genius scientist and master martial artist who created his own style before he hit puberty, with a secret base under Washington DC and technology that rivals that of Batman! He even won the respect of Darkseid and was given a Boomtube! Anarky encountered Green Arrow twice in the comics. They first crossed paths in Green Arrow Vol. 2 #89 (read my review of that issue here. ), and Anarky professed an admiration for Green Arrow while wondering what happened to his idealism after Oliver Queen refused to help him blow up a gun factory. They next met in Green Arrow Vol. 3 #51, where Anarky was portrayed as more of a mad bomber, though he still spoke of admiring Green Arrow and decried that The Emerald Archer had "sold out". Anarky's weapon of choice in the comics is a stylized taser staff. We see the DCTVU version of Anarky making use of a similar weapon in this episode. Curtis Holt is the DCTVU version of Michael Holt aka Mister Terrific. In the comics, Michael Holt was a man "with a natural aptitude for having natural aptitudes". He was a Gold-medal winning Olympic decathlete, held 14 doctorates along with an assortment of Master's and Bachelor's degrees and ran his own technology firm - Holt Holdings. Left suicidal after a drunk driver killed his beloved wife, Holt was visited by the angelic being known as The Spectre, who told him the story of another gifted man named Terry Sloane who devoted himself to heroism under the guise of Mister Terrific, after contemplating suicide himself. Inspired by Sloane's example, Holt became the second Mister Terrific, and devoted himself toward helping the needy however he could and fighting crime with his fortune. Curtis Holt is quite different from Michael Holt in several key respects. Curtis Holt is gay and happily married. Michael Holt was straight and a widower. Thus far, Curtis does not seem to be the athletic type whereas Michael was a peak-human athlete in addition to being a super-genius. The executive pushing Felicity to fire more people is named Mr. Dennis. This could be a nod to legendary Green Arrow writer Dennis O'Neil. Damien Darhk and Oliver both make reference to a gangster named Rick Pinzolo. This was the name of a gangster, played by Stanley Tucci, on the show Wiseguy. The exact power of the shock delivered by Anarky's staff is revealed to be 5000 volts. Ironically - given how the fight with Anarky ends - 5000 Volts is also the name of a British Disco group, whose biggest hit was a song called "I'm On Fire!". The leader of the group running the poppy farm on Lian Yu is introduced to Oliver as Baron Reiter. This is a nod to the super-villain Baron Blitzkreig, though writer Marc Guggenheim has already said this character will not be a Nazi and the focus will be upon Reiter's ties to the organized crime group Shadowspire, which first appeared in Deathstroke #53. The idea of Oliver Queen running for mayor was first suggested in the story "What Can One Man Do?" by Elliot S! Maggin, in Green Lantern/Green Arrow #87. It was his first professionally published story and one of many stories he wrote that explored the idea of superheroes as agents for social justice as well as crime-fighters. Curtis Holt developed an algorithm using a specialized AI to determine maximum profits with a minimum amount of workforce reduction. However, he had originally designed it to develop a value matrix, to argue for company-wide pay increases and raises. Mr. Dennis had him turn it around to figure out who to get rid of. Anarky's taser-staff administers a 5,000 volt shock. Ollie: My name is Oliver Queen. After five years in hell, I returned home with only one goal - to save my city. But my old approach wasn't enough. I had to become someone else. I had to become... something else. I had to become... The Green Arrow. Curtis: Sorry. I probably could have explained that better. Felicity: No, I got the gist. You came up with a list of people that you'd like me to fire. Curtis: (weakly) Work-Force Reduction has a nicer sound to it? Laurel: How did you get the owner to part with his windshield? Ollie: I bought his truck. Ollie: One of the benefits of your girlfriend inheriting a multi-billon dollar conglomerate. We have money now. Quentin: You've been gone. You don't know what this city is facing. Now, I'm not saying it doesn't need saving. But a guy hiding behind a mask isn't gonna get it done. What this city needs is someone willing to stand up in the light of day - not a guy lurking around in the shadows. You say you're going to be different this time, huh? How? Jessica Danforth: Yes, The Green Arrow risked his life to keep the people of this city safe. But who inspires them? Who works to make sure that there's a city worth saving? Who's there to make Star City a place my daughter wants to call home? Ollie: Thank you for rescuing me. Baron: (chuckles) I'm sorry, but we're not rescuing you. First thing you do once you get home is tell people what we're doing here. Ollie:.I - I don't know what you're doing here. Baron: Be that as it may, I can't send you home. Not right now. Good news, though. I have no reason to kill you. Ollie: So what are you going to do with me? Baron: Good question. You survived three years here all alone. That requires fortitude, intelligence - qualities that are of use to me. As it happens, one of my men stepped on a land mine. How would you like his job? Damien Darhk: Now I see why Rick Pinzolo banished you. You're unaware that there are lines one does not cross. Lonnie Machin: I met one of your "ghosts". After I took his tooth, we had an interesting conversation about HIVE. I wasn't led to believe you respected lines. Damien Darhk: I respect Order, Mr. Machin. Discipline. Precision. You are sloppy. All you represent is anarchy. Ollie: Nothing worthwhile ever comes easy. Ollie: Both Lance and Jessica Danforth said something to me about this city needing something that Green Arrow can't offer. Ollie: Hope. Inspiration. Someone who can do things in the light who isn't afraid... someone who can protect themselves. Felicity? Ollie: I'm going to run for mayor. Diggle and Felicity do not have code names yet. Ollie gives Felicity a fern for her first day at work. This is a nod to the fern she got him in 301. In her candidacy announcement, Jessica Danforth refers to the death of Moira Queen in 220. Lonnie Machin cut off his own fingerprints and restitched them onto his fingers in mis-matched patterns as a means of remaining unidentified. Diggle tells Laurel about how his brother was killed by a group called HIVE and how he has spent two years looking for them, theorizing a connection go The Ghosts they are fighting, but not telling Felicity or Ollie about it because he considers it a family affair. Thea is capable of breaking a man's arm with one hand. Ollie makes reference to Malcolm Merlyn's warning in 320 that those who are resurrected by The Lazarus Pit do not come back as the same person they once were. Laurel learns about The Lazarus Pit being used to resurrect Thea and immediately begins plotting a way to use it to bring back Sara Lance. Thea makes a reference to her kidnapping at the hands of Slade Wilson in 216, watching Jessica Danforth on the news after her daughter was kidnapped and wondering if that's what it was like for Moira Queen. Lonnie Machin escapes en route to the hospital after being set on fire by Thea. He leaves behind an anarchy symbol painted in blood as a calling card. In the flashback, Ollie has his hair cut after joining The Baron's men. At the end of the episode, Oliver decides to run for mayor himself in the wake of Jessica Danforth dropping out of the race. Laurel is back to her usual hypocritical self, chewing Diggle out for hiding information from Oliver and Felicity regarding HIVE but then going on to hide her trip to Nanda Parbat with Thea from Oliver. Jessica Danforth is presented as a strong, confident independent woman only to immediately collapse into a helpless victim once her daughter is kidnapped. Jeri Ryan was completely wasted in this role and it's shameful that her casting on this show was built up for such a weak payoff. Ollie's fighting skills seem to be nerfed severely when he goes up against Anarky, purely so Thea can have an opportunity to come in and accidentally set him on fire. A lackluster episode that is reminiscent of the first season villain-of-the-week stories for all the wrong reasons. Anarky is such a one-note joke of a villain you actually feel upset that he wasn't killed off. Virtually all the progress the characters have made over the past year has been jettisoned as everyone is still keeping secrets from everyone else for the sake of prolonging the drama. It's telling that the best parts of the episode are the ones that introduce new information and characters rather than rehashing the same old tropes.